Hands up if you remember Holly Golightly’s four-storey townhouse in the film Breakfast at Tiffany’s? Back in 2012, the house in which it was filmed was put up for sale for a massive $5.85 million. Let’s take a look at how the movie compares to the modern day real thing. From the Outside: (Pictured Above) The movie was set in the 1960s. Check out the fancy awning above the double doors. This is most definitely a house with kerb appeal – you can give your house the same effect by keeping everything clean and looking presentable. If the paintwork on your door is peeling, get your hands on some sandpaper, rub off the loose flaky bits and repaint it. We have plenty of maintenance products for a great price on our marketplace. Through the Door: As you can see, the interior furnishings were very much en vogue for the time. Although nowadays furnishings have become sleeker, it is interesting to note that the neutral colour palette favoured back in the 60s has returned to the height of fashion once more. Give your house a makeover with a lick of paint. This white loveseat was made by simply cutting a bathtub in half – we can’t imagine it was very comfortable to sit on. Modern Day: From the outside, the house really doesn’t look much different. There’s still the same green painted door and the awning to give it an elegant feel. 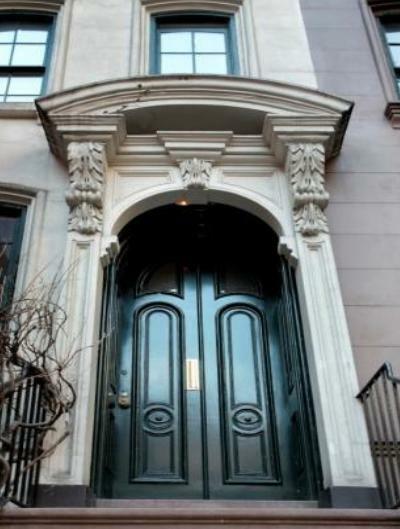 The retention of these details makes it instantly recognisable as Holly Golightly’s house. Nowadays however, the townhouse has been split into two duplex apartments. It’s certainly a far cry from white Formica furniture and seats made from half a bathtub. The sleek monochrome furniture adds a contemporary twist to the more traditional staircase. Give your wooden floors that highly polished shine with Choiceful cleaning products. There’s also a solarium nowadays which is ideal for catching the sun. If your home has a small-ish patio style garden out the back, add pops of colour with brightly coloured plants. Some outdoor seating will allow you to have garden parties and to eat outdoors in the summer months. As you can see, this house has changed a lot over the years. Give your home a makeover today for a bargain price with Choiceful.com products. Check out our Facebook and Twitter pages for more homes from the movies.